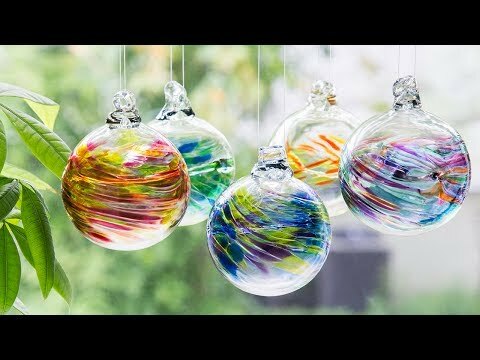 Like trees in a forest, no two of these beautiful hand blown glass ornaments are alike. Each ornament has a special story card with a sentiment for its theme and comes ready to give in a gift box. Whether you place them on a counter or hang them up, when the sunlight hits these delicate orbs they give off a lovely, colorful light. excellent gift for the person who "has everything" she needs. It was as pretty as it looked!! The packaging was even special!! 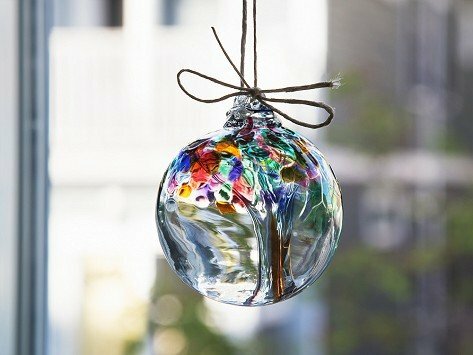 The Kitras have been perfecting their hand blown glass ornaments for over two decades. These beautiful ornaments are inspired by the different shades of traditional birthstones. You can match the color to a loved one’s birthday month. Whether you use them for year-round decoration or just during the holidays, they make for an unusual, thoughtful gift. Each one is carefully crafted from recycled glass in the Kitras’ Canadian studio, with a signature thread of crystal spanning the walls in the middle. It looks like a delicate bridge inside the sphere. Decorate a counter with one, or loop a ribbon, chain, or fishing line through the top and hang it up. It’ll give off a soft, colorful light when the sun hits it. The long legacy of glassblowing is apparent in the Kitras’ handiwork and shines through when you gift one of these artful little orbs.